After spending a few week’s on Blizzard’s PC Public Test Realm, Overwatch’s new hero, Orisa, was released to the general public via a patch on Tuesday. Fangirl has already written about her origin story, but there is a lot to digest when it comes to how a new hero might impact the game. Role: anchor tank — Orisa is designed to fill a role that has felt rather static in Overwatch to this point: the anchor tank. Previously, Reinhardt had been the only tank bearing the burden of providing a large barrier for a team to center around when advancing on a point. 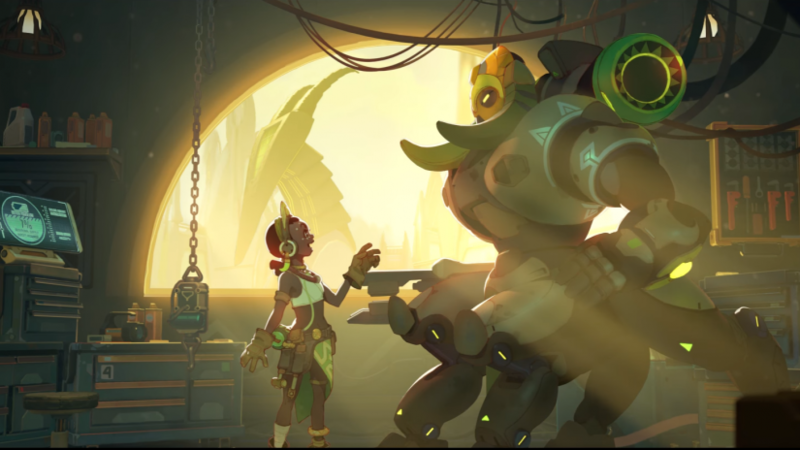 Game Director Jeff Kaplan has repeatedly stated he wants to balance out the game so no one hero is seen as indispensable, and Orisa’s design reflects Kaplan’s desire to provide an alternative, or perhaps complementary, hero to Reinhardt. Abilities and overall usage — Orisa is similar to Reinhardt in that she provides a shield for her team to center around. Where she differs is every other ability. In many ways, she can be considered a combination of several existing heroes. 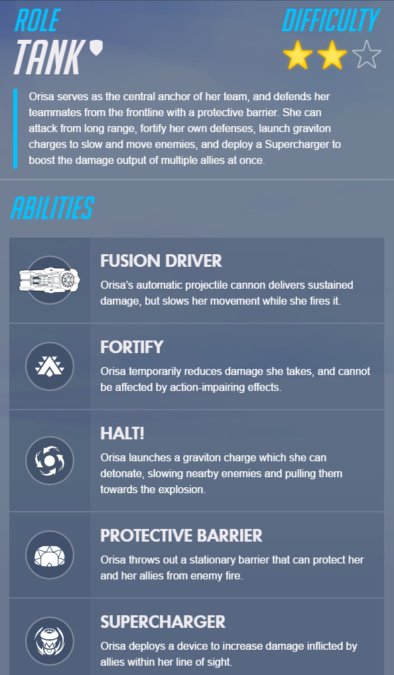 Her ultimate ability, Supercharger, powers up all teammates within range in a similar fashion to Ana’s Nanoboost, allowing them to deal more damage. Her Halt! ability is a miniature version of Zaria’s Graviton Surge, pulling enemies toward it, allowing teammates to focus fire them. Her primary weapon is her fusion driver, which gives her the longest range of any tank hero, and her Fortify ability reduces the damage she takes for a short period and also eliminates action-impairing effects for the same duration. How might this impact the game? — First of all, she will reduce Reinhardt’s use, balancing out the game and providing a new challenge for competitive players. At first, it’s likely she will be overused and perhaps even overpowered, though it took the community a little while to warm up to the idea that Ana was actually a very viable and almost necessary hero pick for competitive teams. Additionally, it looks as if her presence also strengthens Sombra’s appeal, which comes as a refreshing and needed boost after she was relatively ignored by most of the community. With Winston’s barrier also becoming slightly more powerful, it appears as though this patch made barriers a much larger part of the game. Sombra’s hack ability will help relieve this this to some extent, and Orisa and Sombra will deliver a much needed mix-up to the existing meta.